At the time I was in primary school, most kids would say “a doctor” or “an engineer” whenever people asked what they would like to be in the future. Those two were like the most promising jobs our parents told us. Never did we hear of an auditor, editor in chief, or sales manager. It seemed like we had no much choice back then. 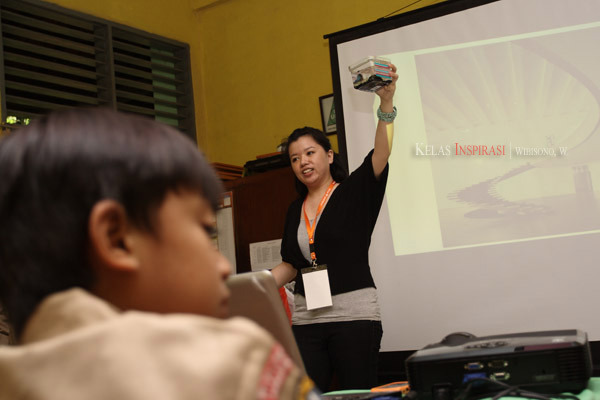 Thanks to “Gerakan Indonesia Mengajar” (http://indonesiamengajar.org) who held “Kelas Inspirasi,” a program in where two hundred professionals participated to share their experiences, at least thousands of students at twenty five primary schools in Jakarta can now figure what careers they can possibly have in the future. 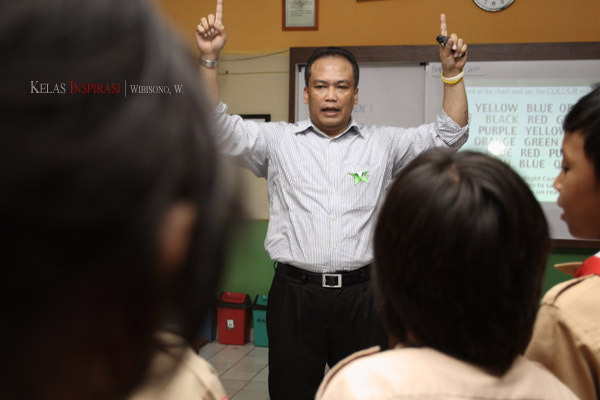 The following pictures were taken at SD Negeri Selong 04 Pagi, a state owned primary school in Kebayoran Baru, South Jakarta, where there were seven professionals spent one day as school teachers. Jeffy Tan, a practitioner of architecture and interior design, was holding up a glass box filled with water and decorated with colorful coral stones. By putting a fish in it, she was trying to visualize the importance of designing the space for living to students. The students were divided into some groups. Each group was liberated to decorate the interior of the glass bowl in which a fish would live. By doing that, the students had been practically introduced to the world of interior design. A group of students browsed through every piece of paper that had been written with words. They were asked to arrange those papers and put them together on a board to create a complete and logical story. All groups of words begun with a capital letter were meant to be the beginning of a sentence and all ended with a point were meant to be the last. That was the clue given by Shirley Pranoto, an auditor working at a prominent company in Jakarta. She tried to introduce how an auditor worked in investigating a financial report of a company: working as a team and checking the reasonableness of a report. 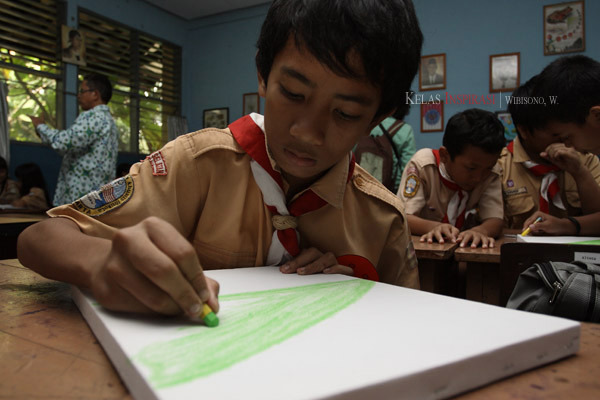 Determined to make the drawing as bright as possible, this student, representing his team, concentrated on coloring the canvass with green color. At the end, the canvass would be put together with other groups’ so as to create one complete picture. "One canvass represents one individual person. Together with other canvasses, they will be one complete picture that represents a team." Explained Shirley about teamwork. Curious to know how the oil was rigged and distilled from beneath the earth, these students were excited to raise the question to Ardi Muawin, a planning manager at a foreign owned oil company. They wondered how the crude black oil could be turned into fuel. 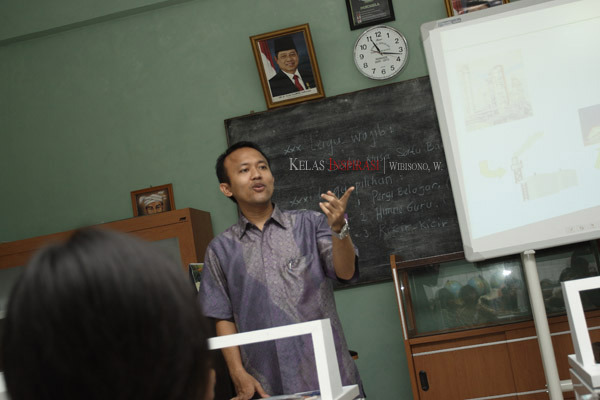 By using graphic which in many cases works more than words, Ardi answered the students' question. 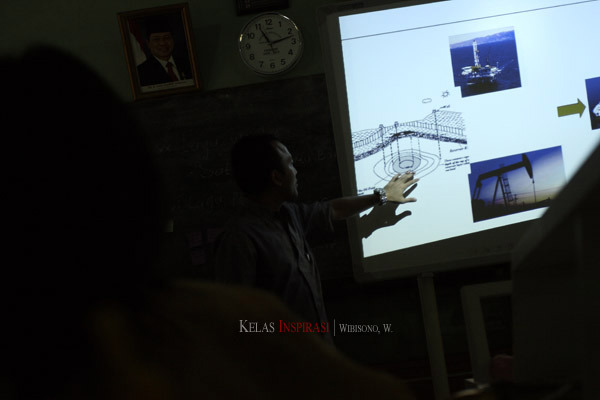 Ardi explained the students how the oil get distilled at the rig off shore, and then shipped to the refinery on shore with oil tanker. Surrounded by enthusiast students, Nora Lestari, a business analyst, shared her experience of working in an oil company. She told the girls that women too could work in such field. 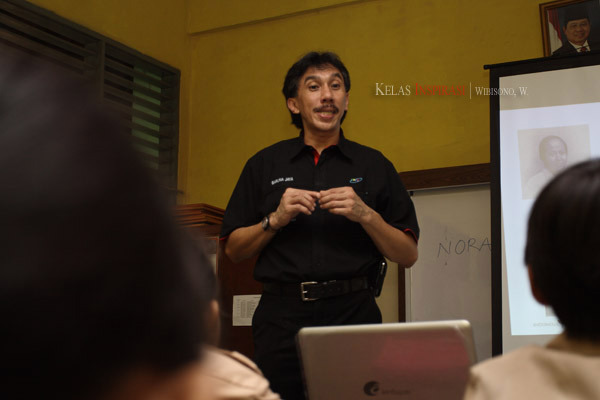 Ridwan Djamaluddin, an ocean scientist, introduced the world of science and technology to students in a very humble way. It took a big confidence for someone to perform in front of audiences. Palupi Ambardini, an editor in chief of a famous teenage magazine encouraged these boys to perform in front of the class. They were required to sing. The students came to understand the world of sales marketing through a simulation created by Floriberto Siddharta, a salesman, currently a director of CORE (Centre for Organizational Excellence). Dividing the students into some groups, Sidd (short for Siddharta) asked each of the groups to erect a tower from cards. “As high as possible.” Said Sidd to them. 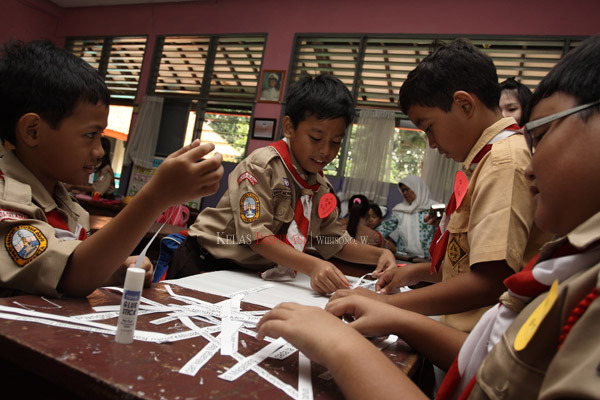 By working as a team, the students learnt that there was a goal in every work, and that took a good leader to reach it. Commonly, people didn’t fold the cards to erect a tower. Apparently it had been sort of common sense in everyone’s mind, and that made the tower the students built kept collapsing over and over again. “Don’t repeat the same mistakes, try to find another way,” Sidd encouraged them. 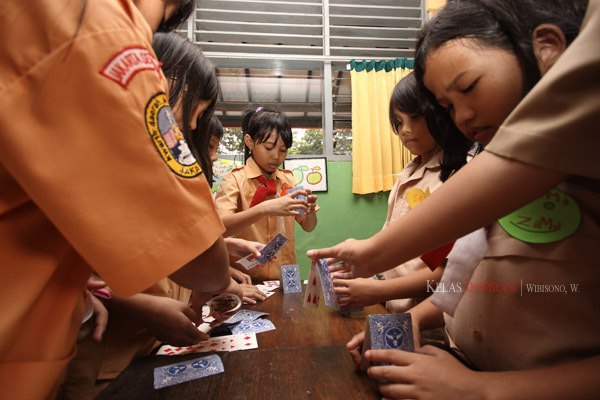 Most students were not aware that Sidd never forbid them to fold the cards. This was the point where Sidd taught them to be creative by removing the obstacle that actually lies in their minds. Having been involved in the world of sales and marketing for more than twenty years, Sidd stressed his teaching that day at how to see a problem and how to solve it by finding the right and effective solutions, and that required creativity. That’s what a salesman had to do to maintain his relation with his customers. Another issue brought by Sidd to the class was about how to optimize the using of both hemispheres of the brain, right and left as each of those played different role which was necessary in solving a problem. At the end of the day, all students were asked what they would like to be in the future. It was great how each of them had their own choice then. I was glad that they no longer defined an engineer just as someone built a long span bridge and high rise buildings like it had used to when I was a kid. And I was gladder that there were great people like those volunteers from “Gerakan Indonesia Mengajar” who were willing to make changes for better Indonesia. ada 2 lagi cita2 yg jadi favorit: astronot sama presiden. Oooh iya... pilot juga deng. kamu ikut ngajar di kelas ini Wib? Nggak Liv... Gue belum bisa ngajarin anak-anak. Hehehe... Ini bantuin motret temen yang ikutan ngajar.